A classic Winchester hunting round in a load manufactured by Winchester. 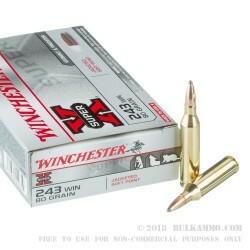 The .243 Win 80 grain soft point is a perfect deer cartridge and offers a lot of flexibility for those who want a high powered cartridge with an easy to shoot projectile and lower recoil. The fast round offers great stopping power in the field on game but also offers a simple learning curve for new shooters and a mild recoil profile. 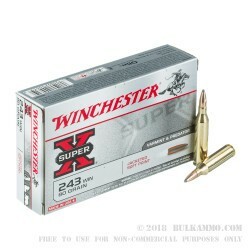 This is the same proven type of cartridge that has sustained the Winchester brand in the recent decades on the ammunition front. Hunters each year go back to the rifles they have experience with and know how to use. These legacy rounds have a ton of history and have been a great base for the larger ammunition manufacturers. The sweet spot for the .243 Win is deer and smaller game including predatory animals like coyote. 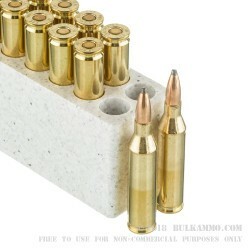 Certainly, with the speed and accuracy of the round, varmint of all types could easily be a target. The Super-X line has an exceptional track record for accuracy, reliability, and consistency. 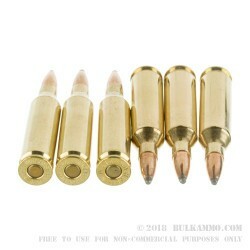 The Boxer primed brass and the soft point bullet make this an easy to reload round with a good projectile for hunting fresh from factory.